In the summer of 1991 Tord Lindman and Johan Högberg (now “Brand”) were looking for musicians with an interest for the progressive and innovative music of the early seventies. Thomas Johnson and Jonas Engdegård replied to their ads with great interest as Thomas, Jonas and Mattias Olsson had a progressive rock band in the past. Eventually they met (although Mattias joined somewhat later in September) and listened to each other’s material. They became friends very fast and started writing and arranging songs immediately. An old song from Thomas/Jonas/Mattias became the basis for “Jordrök” and old material from Tord/Johan became the basis for “Kung Bore”, both major epic songs from their debut album “Hybris”. Anna Holmgren replaced the previously engaged flute player in the spring of 1992. With their line-up completed the band played several appreciated concerts in their hometown Stockholm and around Sweden. In April they visited Studio Largen to record the last song on a demo. Earlier songs were recorded in the rehearsal room and the home of various band members. The following two months were spent rehearsing and arranging the material for their first album “Hybris”. The record was the result of not only four months hard work in the studio but the harvest of a one year struggle of creating music far from the commercial music scene of today. The progressive rock scene raved about the album and eventually the band was invited to play at the annual Progfest in Los Angeles in May 1993. A new track “Gånglåt från Knapptibble” was recorded in August 1993, because the English magazine Ptolemaic Terrascope wanted to release a single to come with the magazine. It was during a period of energetic flow that the song (which later formed the basis of “Skogsranden” from the “Epilog”-album) grew to something crazy and funny. In December the band did a mini tour in Mexico and USA where they played their own compositions as well as a couple of covers (from Gensis and Trettioåriga Kriget). The second studio album, “Epilog” was recorded in the summer of 1994. While “Hybris” featured some moments of somberness, “Epilog” finds this emotion intensified in an all-instrumental setting, which is sometimes aggressive, sometimes contemplative and almost always heavy with wistfulness and stoicism. The music sometimes sounds closer to the band’s Scandinavian roots than the more overt symphonic progressive of their first album. Flute and Mellotron are both given prominent roles in defining the morose nature of the sound here, while electric guitar and organ are often at the forefront of the harder sections. At this time the band was already falling apart. In November 1994 Änglagård headlined the first day of Progfest in L.A., which would become their last concert for almost a decade. The band stopped rehearsing and writing. A year later they met again to edit the recordings made during Progfest, which were eventually released as “Buried Alive”. In 2002 the band reformed again, this time without Tord Lindman. A set of concerts were mainly the target this time but two new songs were also presented, at that time only referred to as “new song #1” and “new song #2” but was later developed into “Sorgmantel” and “Längtans klocka” for the third studio album “Viljans Öga”. After countless rehearsals the band finally returned to the stage in June 2003, playing a highly anticipated headlining show in their hometown Stockholm. Eventually they appeared at the German Freakshow-Festival and at NEARfest in the United States, both a huge success for the band and an unforgettable experience for the audience. After a few more shows in France and Belgium, Änglagård took a break, focusing on their jobs, families and other musical activities. Meanwhile, “Hybris” and “Epilog” were re-released once again. In 2008 Jonas, Johan and Anna met up again and shortly thereafter Thomas who lived in England at the time. A short period, at the end of arranging, Tord was also engaged but did not continue. In 2011 Mattias gets engaged again as the bands began rehearsing and recording a new album that contains the two new songs played in 2003 along with some brand new material. The band returned to NEARfest in 2012. The new studio album “Viljans Öga” was released in June 2012. The year of 2013 was rather hectic for vintage retro prog-giants Änglagård. Known for their previously long periods of absence from record making and the live scene, the spring tour of 2013 was a big exception from the past. The release of the masterpiece ”Viljans Öga” in 2012, the arrival of original member Tord Lindman and new members Erik Hammarström (drums & percussion) and Linus Kåse (keyboards & saxophone) and quite a few good bookings was a turning point for the band and made a great prelude to the upcoming success. The somewhat decimated lineup of the band (the band now consisting of Anna Holmgren, Tord Lindman, Johan Brand, Linus and Erik) was no musical limit, but opened up the Swedish symphers sound to a wilder and tighter, heavier and harder swinging dynamic hell broth. Änglagård released “Prog på Svenska” an unbridled recording of the new lineup’s first live performances. Sharing the stage with Crimson ProjeKCt for three nights at the legendary Club Citta in Tokyo, the unleashed energy and curiosity of this new creative group, literally playing on their toes, is a guaranteed listening experience. After Japan, the band went to the other side of the world playing at the Baja-Prog festival in Mexicali Mexico, went further to play at the Night Of the Prog at Loreley Germany later in the summer (after visiting Belgium and Poland as well). All live performances got standing ovations from the audiences, created a buzz in the prog-world and got brilliant critique. In 2014, Änglagård kept on with live shows. Invited by Mikael Åkerfelt (Opeth) to the Roadburn festival in Holland, they performed to a sold out venue and cheering large audience. Further on, the band returned to Mexico for a concert in Mexico City, a sweet return to the large City after more than 20 years (last time was in 1993). During the summer shows were made in England and Italy for the first time. London offered a tight and crowded (but lovely) pub venue were the audience almost literarily were squeezed up on stage. Veruno in Italian offered a festival and engaging the whole city. Änglagård used the local polis station as backstage dressing room. In September 2014 Änglagård once again became a sextet constellation as Jonas Engdegård rejoined, a line up that the band did not have since 20 years back (after disbanding in 1994). The band was now very excited returning to the dual-guitar concept. This opened up for arrangement and timbres that stayed very close to the heart of Änglagård, as well as giving the audience all the full original guitar scores of the old songs. 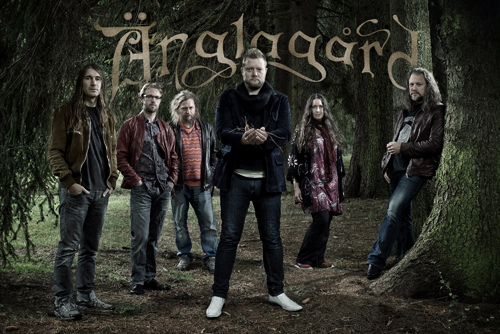 In 2015, Änglagård will be performing at a number of locations around the world (se concert section for further details). Moreover, the band is also slowly working towards a new studio album along the cascade of live shows.